March/April 2018 print issue of Concrete Homes + Low-Rise Construction Magazine. 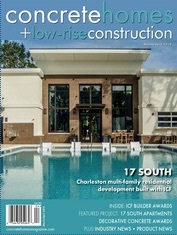 EYC Companies—a privately owned real estate development company based in Charleston, South Carolina—was recently recognized by the ICF industry for excellence in design and construction of a multi-family community. Ellis Coleman, president of EYC Companies, has specialized in the creation and redevelopment of residential and mixed-use communities around the southeastern U.S. since the mid-1990s. EYC Companies developed the project from the ground up as a model of energy efficiency and strength, utilizing the benefits of ICFs to build its “next generation” multi-family project with its general contractor affiliate Front Street Construction Services. 17 South Apartments, consisting of 220 units in seven buildings, is located on Highway 17, a major artery in Charleston. The project’s high-profile nature helped it earn the 2018 ICF Builder Award for Best in Class – Development. The seven residential buildings comprise nearly 250,000 square feet. With all exterior walls and interior shear walls built using ICFs, that translates to 116,871 square feet of ICF walls. Approximately 22,000 Amvic ICF blocks were used on this project. Some innovations were incorporated to keep costs down and expedite the concrete pour. Commercial recessed windows and doors, required by the Charleston Design Review Board, require special attention when using ICFs. To facilitate this a vinyl pocket was utilized in the ICF openings to allow for 8-inch recesses and waterproofing in one step. Wood was used to frame the parapets using vertical trusses with built-in notches. Charleston is a fast-growing city. Boeing opened an assembly plant for the 787 Dreamliner here in 2011 and has continued to expand. Many other global manufacturers have followed suit, resulting in an employment boom and dynamic rental housing market. Coleman has lived in Charleston since 2009, so looking to his own city for a big development like this just made sense. The project was also designed with R38 open cell spray foam insulation applied from the top of the ICF exterior wall across the underside of the roof sheathing, effectively completing the envelope. They also chose a central gas water heater. “Those components together are saving about 40 percent of the energy costs compared to our typical wood-frame buildings and it’s mostly passive so once the building is in place you enjoy the benefits of that for a very long time,” Coleman says. The exteriors are brick and stucco and ICF lends itself to those finishes very well. The stucco is a three-part system that is directly applied to the ICF. Cost wise, they ended up spending about $3,500 to 4,000 more per unit than they normally would on wood frame.